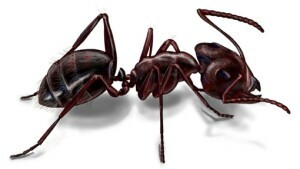 Carpenter Ants – Pesterminate Inc.
Carpenter ants are capable of causing extensive damage to your home. The burrow through wood, window frames, as well as structural supports. This damage often takes place behind walls, leaving carpenter ant damage unnoticed to the un-trained eye. Our guarantee is extended to most home owners, please contact for further details. Carpenter ants are one of the largest ants found in North America. The worker carpenter ants have a length range of about 3 mm to 13 mm, while the queen may be more than 25 mm (1”) long. The most common colour is black, but there are some species that are red and black, solid red, or brown. Carpenter ants have a circle of tiny hairs on the tip of the abdomen and one node in the petiole. From the side, the thorax is evenly rounded. Outdoors, carpenter ants nest in any wood that is in close contact to a moisture source (i.e. stumps, landscape ties and wooden fence posts etc). In buildings, they often make their nests in hollow doors, in wood cabinets near dishwashers, in damp locations behind baseboards, fireplaces, window frames, and in basements and attics. Carpenter ants usually limit the size of the colony to the area of the damp wood. However, multiple colonies could be constructed in the same structure.